The Polisario delegates, who bear an Algerian passport, started complaining as soon as they arrived in Abidjan to attend the AU-EU summit. They complained about their accommodation “in hotels other than the Hotel Ivoire” where most of the “genuine” heads of state were staying, reports the Ivorian website “La Diplomatique d’Abidjan”. According to the Ivorian media, the diplomats who were busy Monday and Tuesday preparing for the AU-EU summit said they were exasperated by the Polisario delegates, who did not stop complaining about their accommodation. 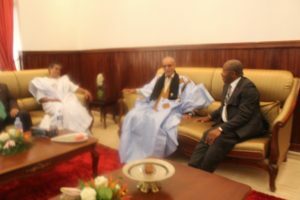 Moreover, the Algerian Press Agency (APS) and its Sahrawi colleague “SPS”, two leading specialists in misinformation and propaganda at the service of the Algerian regime and the Polisario separatist theses, have committed a serious blunder in their coverage of the arrival of the Polisario leader Brahim Ghali in Abidjan. According to the two agencies, Ghali was welcomed on Tuesday upon his arrival in Abidjan airport, by two Ivorian ministers, those of the civil service, Saïd Fava, and of tourism, Touré Mamada. But it turns out that it is pure intox. He was received only by Touré Mamada, who is actually Secretary of State in charge of Technical Education and Vocational Training. And the welcome was rather cold, as shown by the footages relayed by the Ivorian media. Meanwhile, “genuine” heads of state were greeted by President Alassane Ouattara in person.